As a kid, it is far too easy to take for granted how our parents take care of us. We are so completely dependent on their nurturing, from clothing and shelter to food and love. Always excited to be a "grown up," kids barrel to become independent. Too often do parents hear, "No!" and "I do it myself!" from even the littlest of mouths. As kids grow into adults, becoming parents themselves, their eyes are suddenly opened to the amazing amount of selflessness their parents poured out to them in their formative years. We make the transition from being cared for to caring for. What we often don't anticipate, though, is the reality that the people who once cared for us may need caring for again as they age. It is a strange yet beautiful service we give our parents and former caregivers: reciprocating the gift of care. This gift, while beautiful, can be taxing. I watched both my mother and my in-laws care for their declining parents several years ago. I was amazed at the steadfastness, the tenderness, the selflessness that came with the duty. Some days were better than others. Some days there was laughter, other days pain. And as each life neared an end, there was a sadness as well as sweetness in relief the day they were able to say goodbye to their deteriorating and hurting bodies for greater things. I saw my mom and my in-laws with new eyes after this experience. I became acutely aware of the weighty task caregivers have as they take on the care of their older loved ones. Caregivers everywhere deserve to be recognized for the important work that they do, and this Mother’s Day and Father’s Day remind us why it’s worth it. 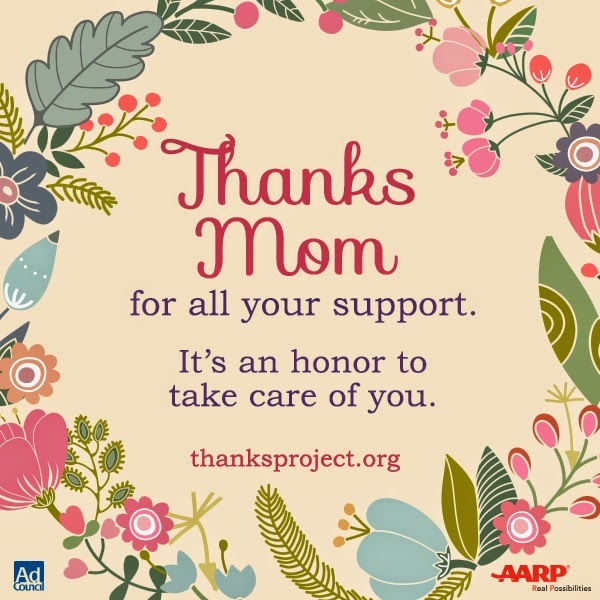 The AARP has started a fantastic campaign called the Thanks Project. The Thanks Project is an online platform that enables caregivers to publicly recognize the parents whom they care for. Each individual ‘thanks’ will be integrated into the interactive tapestry, representing the 42 million caregivers in the US. It's their goal to give caregivers some easy ways to honor the person who raised them.What a beautiful way to commemorate the parents and grandparents who raised us! Caregiving is a big job, and no one should have to do it alone! How will you honor those who cared for you as you grew? How will you commemorate your caregivers this Mother's Day and Father's Day? Disclosure: Information was provided by the Ad Council, but no compensation was received for this post.